Mueller-Kueps 609 399 Press and Pull Sleeve Starter Kit by Mueller-Kueps at Lazaranda Dallas. MPN: 609 399. Hurry! Limited time offer. Offer valid only while supplies last. 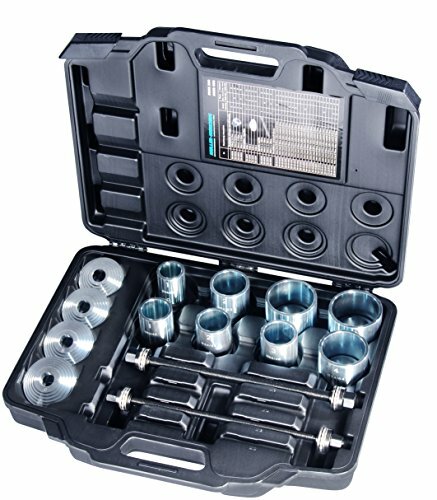 Universal tool set for extracting and mounting: silent bearings, hydraulic bearings, ball bearings, rubber bearings, shaft seals, and bearing bushes. View More In Bushing Tools. Universal tool set for extracting and mounting: silent bearings, hydraulic bearings, ball bearings, rubber bearings, shaft seals, and bearing bushes. The universal application makes it ideal for various vehicles. Includes 8 common sized sleeves ranging in diameter from 44mm to 82mm (1-3/4" to 3-1/8")., 2 Spindles, 4 Discs.